...and much, much more. So give them a call, or stop by, and see how they can help you enjoy the park. The Calaveras Big Trees Association, a non-profit 501(c)(3) organization, is responsible for operating the bookstore inside the visitor center. The bookstore has many unique and one of a kind items for all members of the family. Come browse our large selection of books, t-shirts, puzzles, and more. 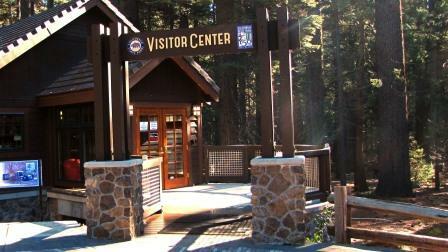 The bookstore is open the same hours as the visitor center so come on in and take a look. The visitor center has a wonderful museum for your enjoyment. We have many large and small mammals on display as well as hands on items for your viewing and educational experience. Do you know what a 400 pound Black Bear looks like? What is the difference between a Mountain Lion and a Bobcat? Find the answers to these questions and many more. With birds and squirrels; rocks and Miwok Indians; loggers and fires, there's something in the museum for everyone. Admission to the museum is included with your paid admission to the park.